Top Notch Material: Join in on the Fun of Elf Traditions with Elf Magic- UNTIL CYBER MONDAY BOGO! Join in on the Fun of Elf Traditions with Elf Magic- UNTIL CYBER MONDAY BOGO! I just learned about the Elf Magic tradition and thought it was perfect for our family. So we asked Santa if he could send a couple of Elves to visit us and we were thrilled when he sent us me two elves. Elf Magic agreed to send me two elves. One for each son. 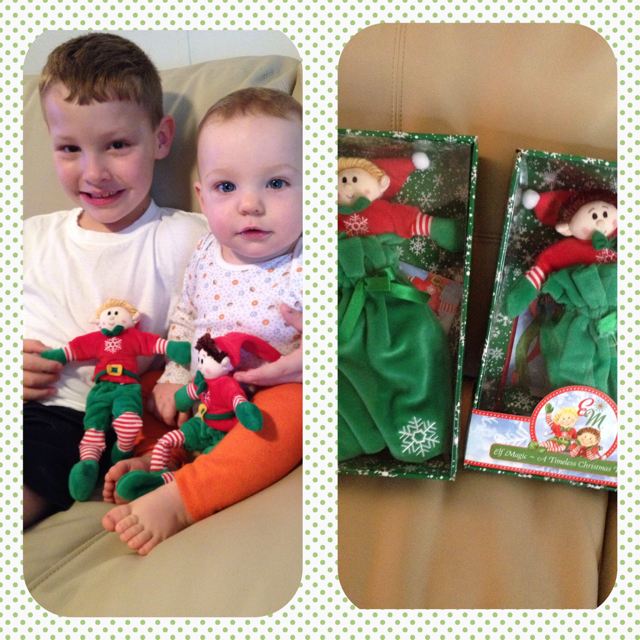 I chose the blonde elf and the brunette elf because I think my youngest will have darker hair than his brother. When the Elves arrived and I started telling my oldest about what they did, I watched his eyes start to get wider. As I read to him the letter and care instructions from Santa he exclaimed, "THIS MIGHT BE REALLY FUN TO SEE WHAT THEY GET INTO, MOMMY!" He was so excited! Santa suggested that he might be found in the freezer because that reminds him of the north pole, or even hidden under some unrolled toilet paper. Santa also said that sometimes, if he is found with his bag, then there might be a small gift inside. Of course my little man LOVED that idea!! The Elves came with a poem about how the arrived to our home. So, we have lovingly welcomed Spencer and Emory into our home (they come prenamed) and now Mommy has to come up with ideas of which adventures they can get into. One of my FAVORITE is having the elves make snow angels with salt! How cute!! 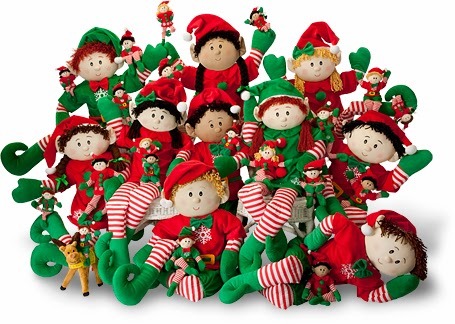 We are just thrilled with the fabulous quality Magic Elves we received, and I know my boys and I are going to have a blast with them after thanksgiving! My oldest cannot wait until the first night when we can sprinkle the magic “North Pole Snowflakes” on them and leave them crackers and water! You might be holding out like I was, but I am telling you the delight I saw in my little mans eyes, and how gentle he was with his new Elf buddy Emory made me wish I had joined the fun years ago!! I know this is going to be an exciting holiday season, and we will be making memories that last a lifetime!! Elf Magic also has Hannukuh Helpers, "elfits" to wear, books and much much more!! Check them out on facebook and pinterest!